George Graham Reviews Paul Simon's "You're the One"
One of the most durable performers of the rock era, with a recording career that goes back 43 years, Paul Simon has also been one of the most influential. In the mid-1960s, he and Art Garfunkel were the quintessential Sixties folk-rock group, with Simon penning songs that became virtual anthems for a generation. In the 1970s, he continued to enjoy success on his own as his songs reflected the stages of life through which he and his generation moved. Then in 1986, Simon created one of the most innovative and influential pop albums of that decade, Graceland which introduced American audiences to the joys of African music, and was an important catalyst for the emergence of the World Music scene in the US. He followed that with another ambitious, though somewhat less seminal recording The Rhythm of the Saints which brought in some contemporary Brazilian influences. In 1997, Simon directed his attention to another equally large project, a Broadway production written with South African poet Derek Walcott called The Capeman. It was an intriguing and musically worthwhile production, but it did not last long on Broadway. Now Paul Simon is out with another new project, and interestingly, it is his first recording since 1983's Hearts and Bones not intended to be a concept album or part of a larger project. It's called You're The One, and it turns out to be his best album since Graceland and probably one of the best of his career. Another distinctive feature of You're the One is that it is performed by a regular band, with a few guests, rather than a large cast of musicians brought in for specific pieces. However, it retains the world music influence that goes back to Graceland, with a delightful and often seductive mix of African rhythms and intriguing percussion. Lyrically, Simon says that he looks upon this as a collection of stories, some seemingly autobiographical, and some decidedly allegorical. He examines love, relationships, family, and his own place and age in the world, in words that outwardly seem optimistic but can be bittersweet when re-considered. He sings the songs in a gentle, almost reverential style, while the group around him delivers multicolored instrumental pastels. The band on the CD includes guitarist Vincent Nguini, with whom Simon worked on Rhythm of the Saints, bassist Bakithi Kumalo from the Graceland album, drummer Steve Gadd who played with Simon in the 1970s on Fifty Ways to Leave Your Lover, and percussionists Steve Shehan and Pocono-based Jamie Haddad, well known regionally for his work with the David Liebman Group, featured on our Homegrown Music series. Haddad is known for his brilliant percussion work, and he adds much to this CD, with wonderful percussive colors and some fascinating rhythmic approaches. To the core group are added guests playing unexpected instruments like steel guitar, pump organ, bamboo flute and harp. 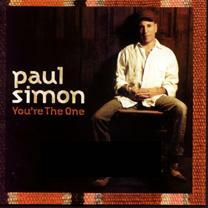 Paul Simon's new CD You're The One marks his first release in seventeen years that was not an ambitious concept album part of a larger work, and yet it's one of the most intriguing recordings of his career and no doubt the best since his ground-breaking world music release Graceland. This time working with a regular band of blue-chip players, but retaining the world music influence, and with the freedom to take the songs where he wished, Simon creates a subtle masterpiece. The fascinating musical setting, some of Simon's best lyric writing in a long time, contrasted with the generally contemplative mood of the recording makes this an album that you'll find yourself coming back to time after time, and discovering something new each time. Our sound quality grade is a solid "A," with engineer Andy Smith nicely capturing the distinctive instrumentation, and enhancing the mood of the recording. Even the dynamic range is pretty respectable for a major-label release. Paul Simon has enjoyed many hits in his career, but he has also known some commercial disappointments. Music as subtle, deep and musically eclectic as You're the One has almost no chance to reach the top of the commercial music charts these days dominated by the likes of Eminem and Britney Spears. But despite his occasionally expressed desire to have another hit, Simon made no compromises on his new album. The result is a brilliant record that stands as one of the finest so far in 2000, and in Simon's own 40 year recording career. (c) Copyright 2000 George D. Graham. All rights reseved.